Exercise designed to combat racism and social injustice. Art and Remembrance is a not-for-profit 501(c)(3) corporation founded in 2003 by Bernice Steinhardt and Helene McQuade, the daughters of Holocaust survivor Esther Nisenthal Krinitz. They grew up with the stories of their mother's courage and suffering as a child during the war. Years later, after their mother began to turn her stories into a narrated series of fabric art pictures, they realized that art and story combined had enormous power. They believe that together, art and story could help people understand not only what war and intolerance are, but also how it feels to those who endure them. Art and Remembrance aims to use this power (the power of personal narrative in various forms of art) to illuminate the effects of war, intolerance, and other forms of social injustice on its victims. The primary goal of Art and Remembrance's educational programs is to open the minds of school-age children to the powerful experiences of victims of social injustice, as narrated through art. Through guided study on the works of A&R artists, students will be encouraged to reflect upon and gain a greater understanding of important issues such as cultural diversity, prejudice, the Holocaust, and other historical and contemporary manifestations of racism. Through the study of narrative art, A&R also hopes to empower children to share their own stories, and to learn about various techniques that will enable them to do so through art. The Hero Project was undertaken by 5th Grade students at Hunter College Elementary School who wrote and illustrated a story about a family member who had displayed hero qualities. Their stories and art are exhibited in the A&R Gallery. The writing unit lesson plan and the art unit lesson plan are available for download. Students at Bailey's Elementary, an urban multi-cultural magnet school, wrote and illustrated Stories of Perseverance about family members who did not give up when faced with adversity. The lesson plan is available on this website. 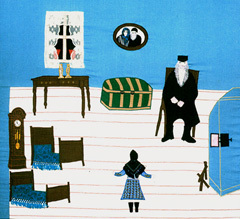 A&R' educational materials are designed to accompany the exhibited work of Esther Nisenthal Krinitz, Through the Eye of the Needle: Fabric of Survival and help students develop a deeper appreciation of tolerance, social justice and peace. Educators and students may download PDF files for an educator guide and student questions for a guided exploration of Esther Nisenthal Krinitz' art and story. Educators are invited to contact A&R to share ideas on using these materials and integrating them into Holocaust education curricula. Online resources for the further study of narrative art, the Holocaust, and other peace and social justice themes are planned, and will be made available through the A&R website. Images and text © Bernice Steinhardt and Helene McQuade, courtesy of Art and Remembrance, Inc.